I wanted to bring you my round up of all the Liberty print finds in kids design. Classic Liberty print is reaching all facets of children’s interiors and clothing and I can see no sign of this trend abating. Mixing Liberty print with other natural materials such as linen and pure wool is ideal for creating a classic, timeless children’s comfort space. 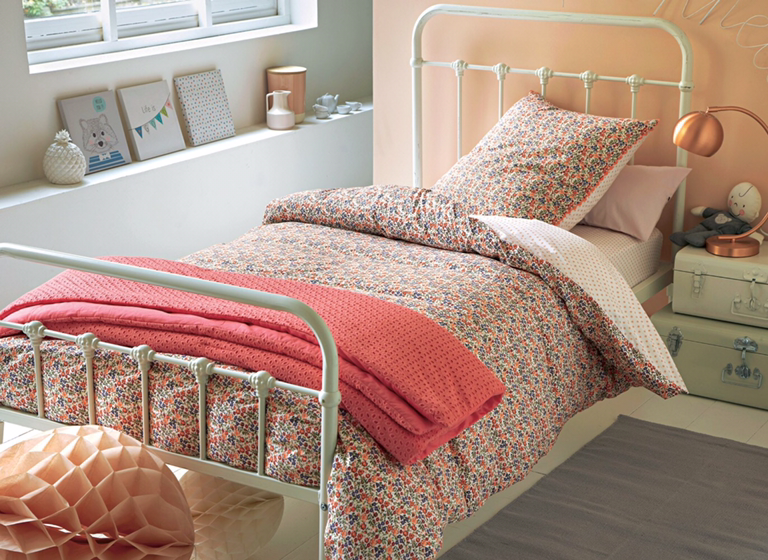 I have found beautiful bedding from Coco and Wolf and also a high street buy from La Redoute. Both look best teamed with different textures and layers, rather than ‘matchy matchy’. Coco and Wolf with Little B have some beautiful swan cushions and pillowcases so if you just wanted to update existing bedding with a few touches of print, then this would work really well. 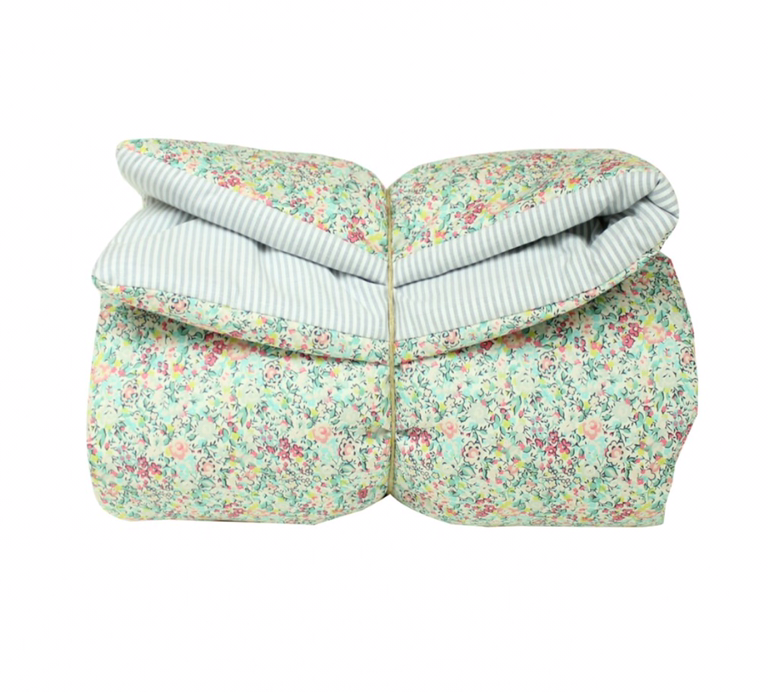 Also notable from Coco and Wolf with little B are the changing mat covers In a choice of fabrics. 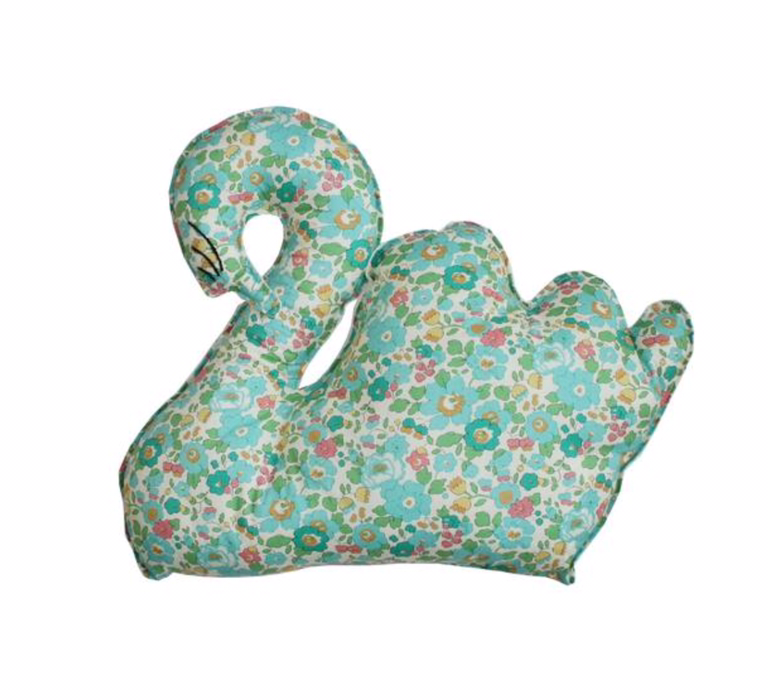 Swan cushion from the Little B range by Coco and Wolf. 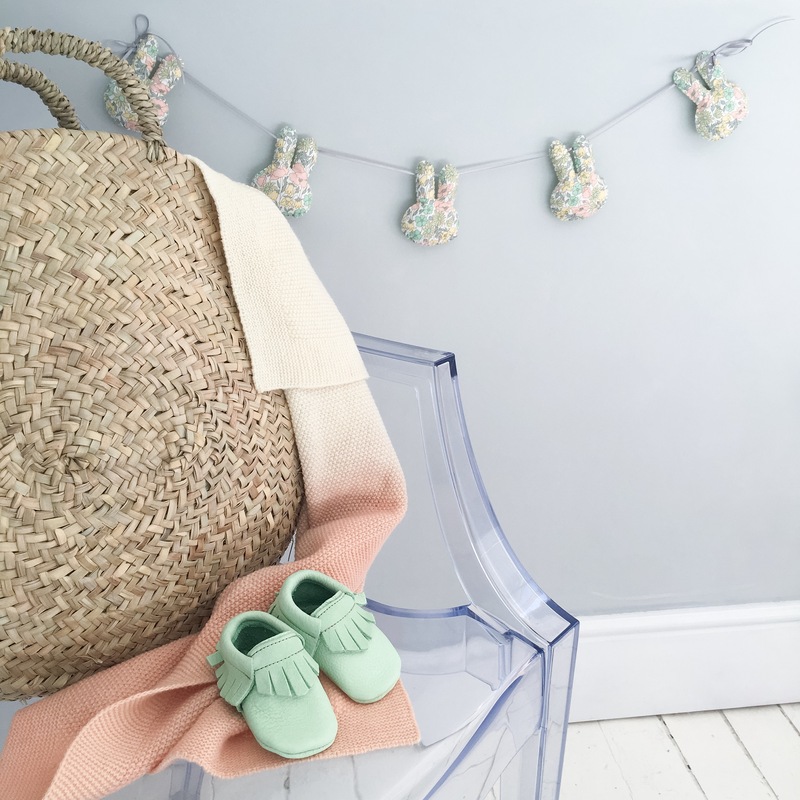 Other innovative ways to bring a touch of print to your nursery or children’s interior are the lovely name wire signs from Little Cloud. 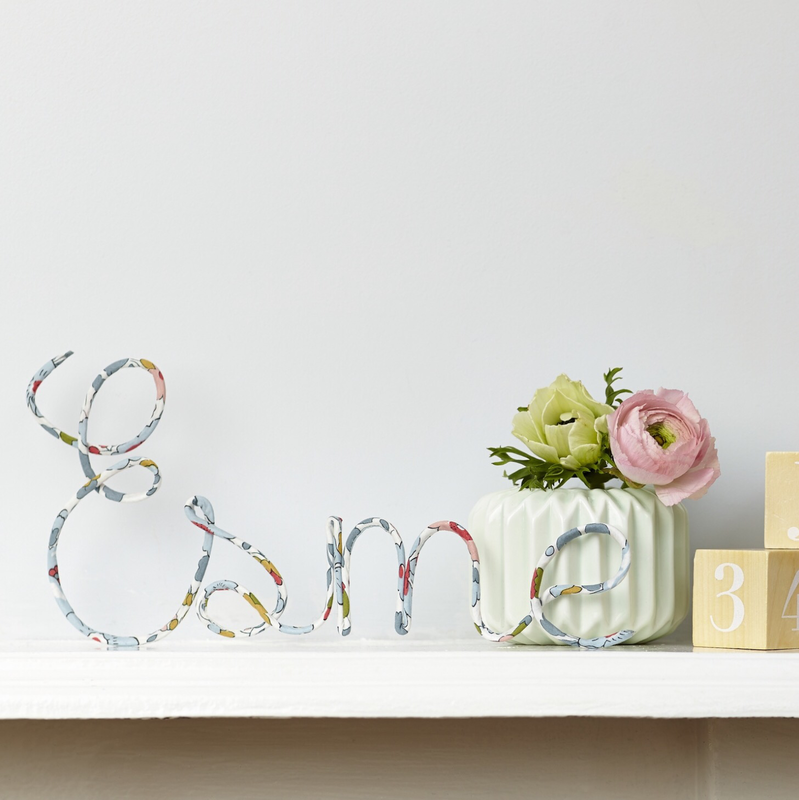 These pretty name signs would look adorable hung above a bed head or on a shelf. I’m going to treat the baby to one nearer the time. 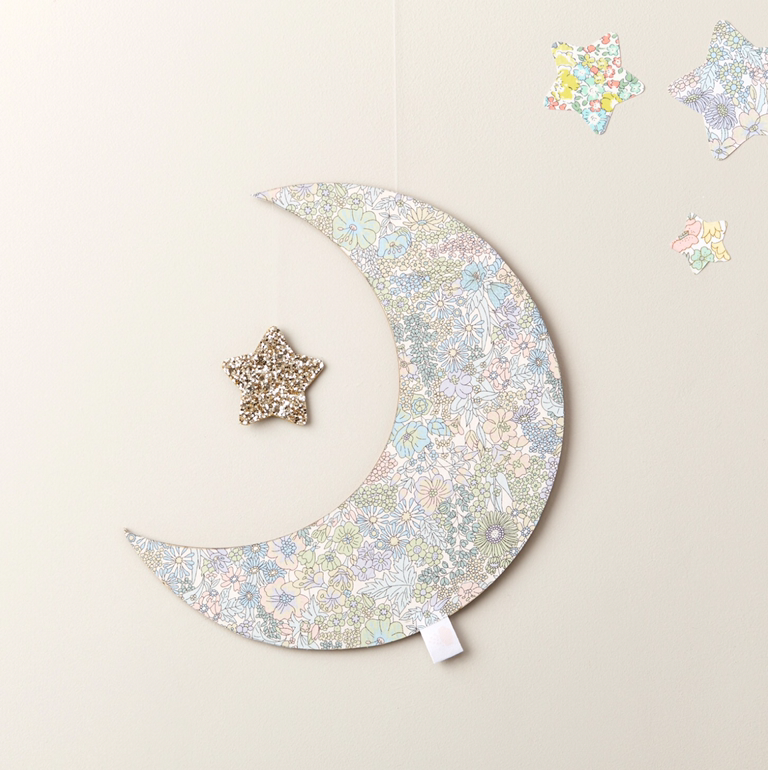 Also from Little Cloud are the lovely moon wall hangings, they would look perfect in a child’s room with one of our Liberty collection garlands, it’s perfect to mix and match prints as long as the base colours are soft and neutral. 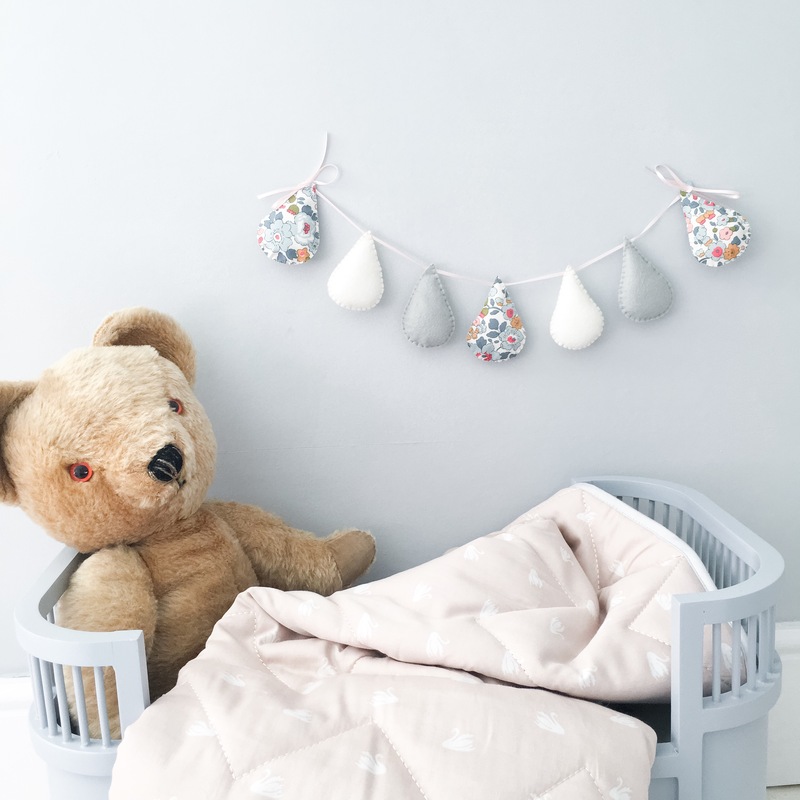 Little Cloud also have a great range of cushions, hair clips and crowns by the amazing Fable Heart and delivery is free within the U.K.
Velveteen Babies Betsy Cloud garland. The raffia bag is from The Tipi and all moccasins throughout are by Wolfie and Willow. 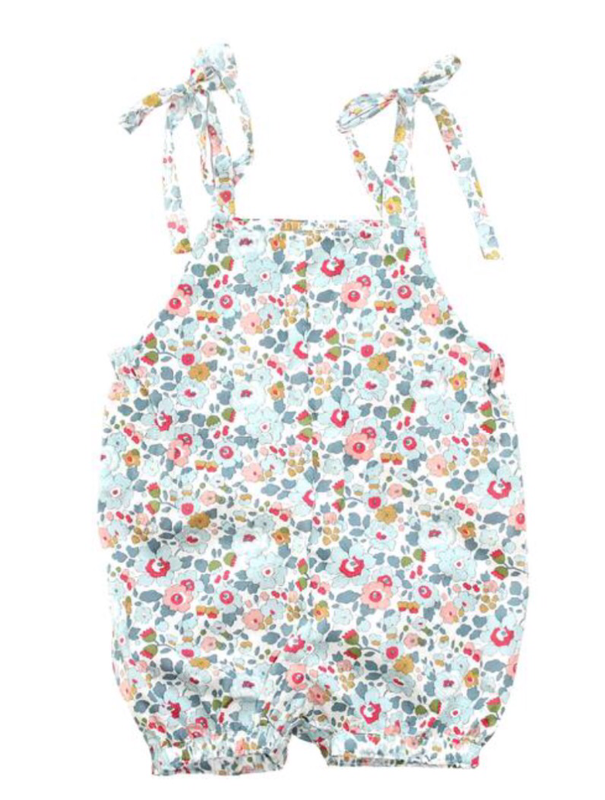 I’ve also fallen in love with many small businesses producing the most lovely Liberty print baby clothing. 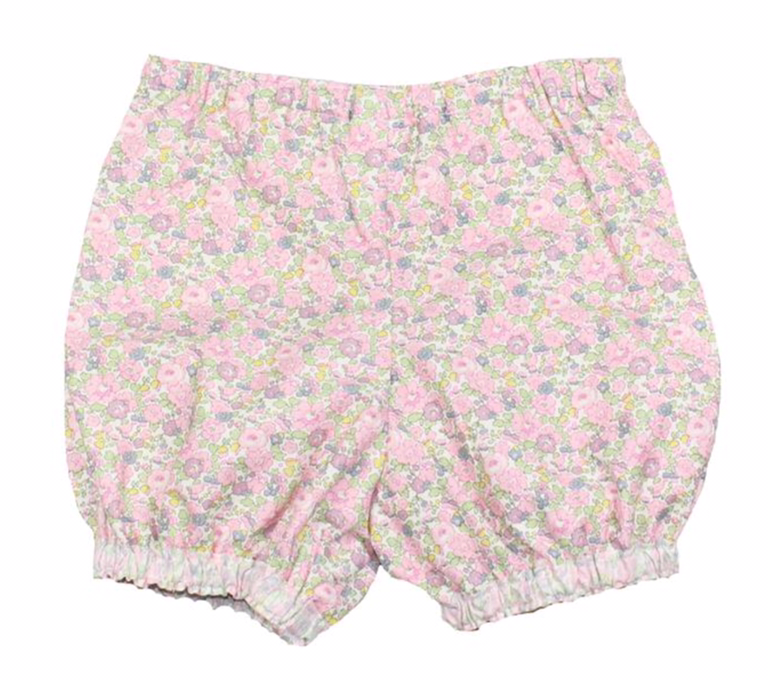 My most recent find is Olivier Baby who have a sweet selection of rompers, bloomers, dresses and tops in a choice of prints and linens with accessories such as ribbed tights and knitted bonnets to complement the range. They have a flash sale on some of the range so take a peek! 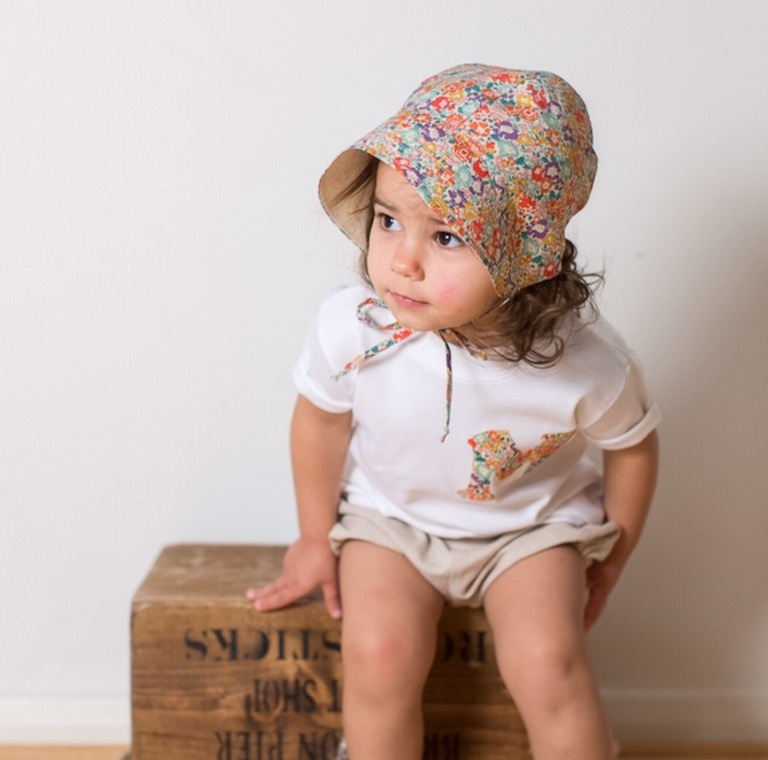 with a huge range of beautifully made children’s clothing encapsulating the very best of the Liberty print range. 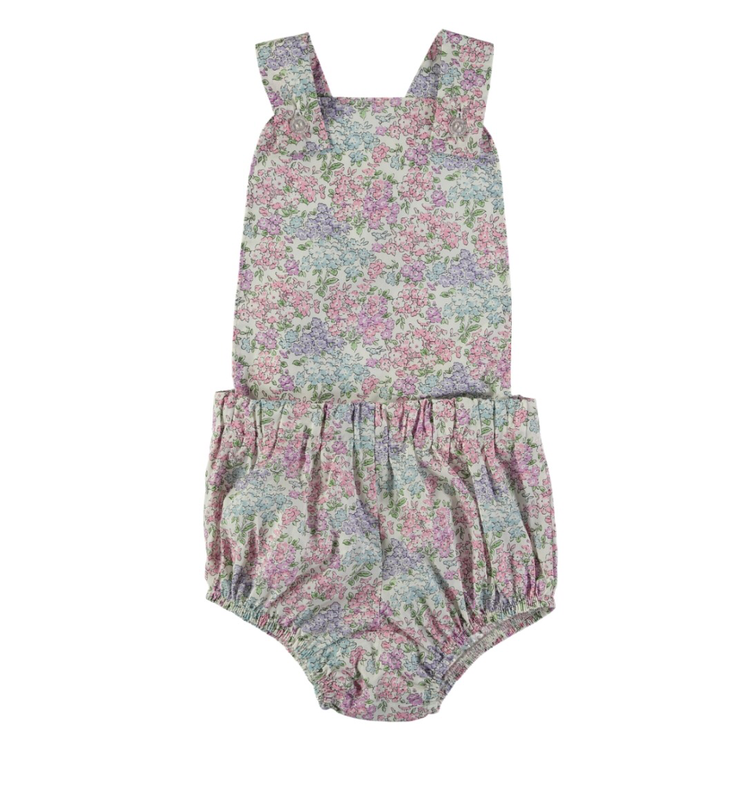 We love the little bloomers and tie top summer suits, perfect for older babies with plenty of leg rolls! 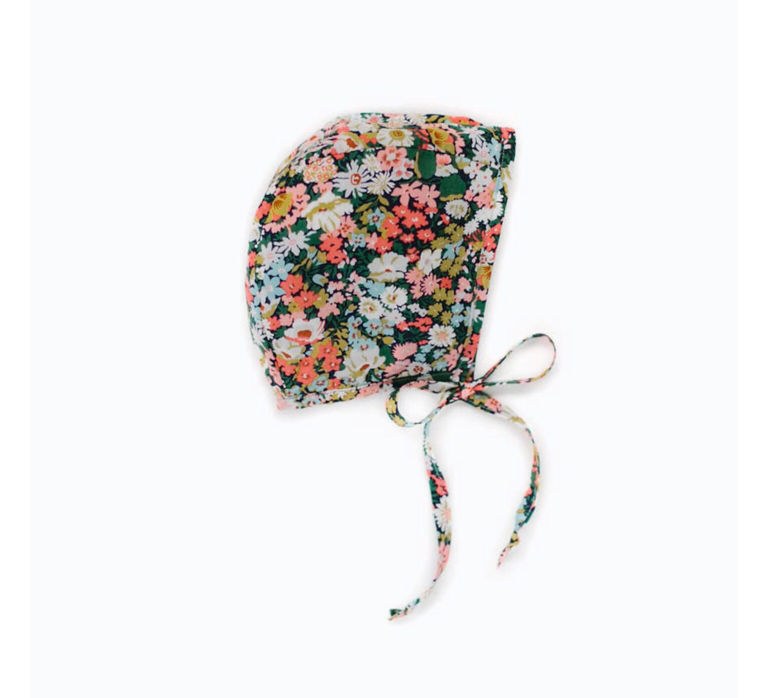 Bonnets are also crucial to Bebe styling too. 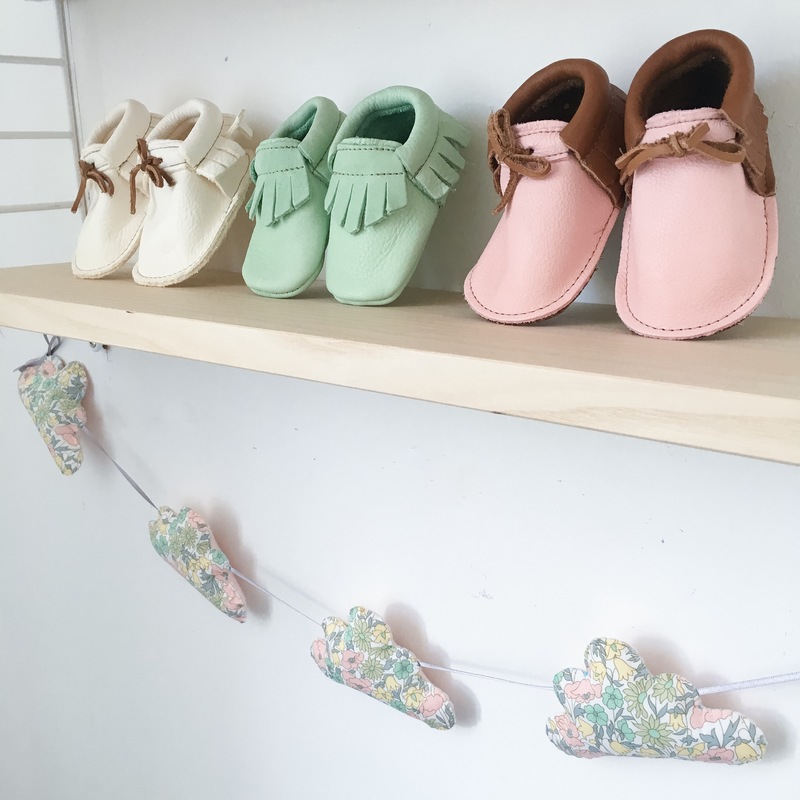 I’ve already bought a smal stash from Briar Handmade (from Mama Owl in the U.K) and they come in a wide range of colours, prints and sizes to suit all little heads. Also noteworthy are the sweet bonnets and appliqué baby vests and T-shirts from Magnificent Stanley. This UK small business is run by Becky who handcrafts each item from her studio in Lewes, East Sussex. Finally, for a seriously budget friendly take on Liberty print, head to Uniqlo where they have a limited edition Liberty X Uniqlo collection. 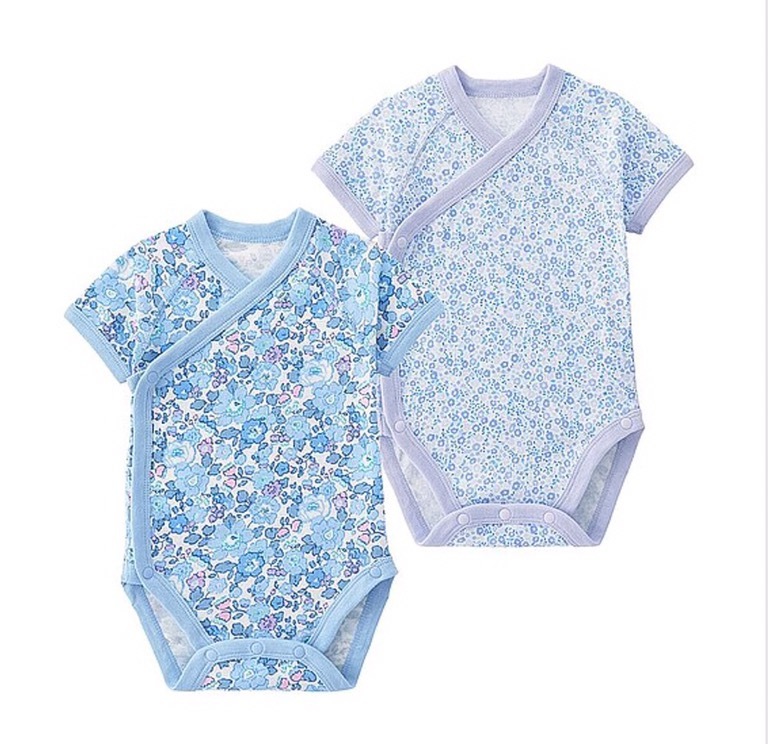 Girls dresses are from £9.90 and double baby vest sets just £7.90. There are styles for both sexes and also a women’s collection. 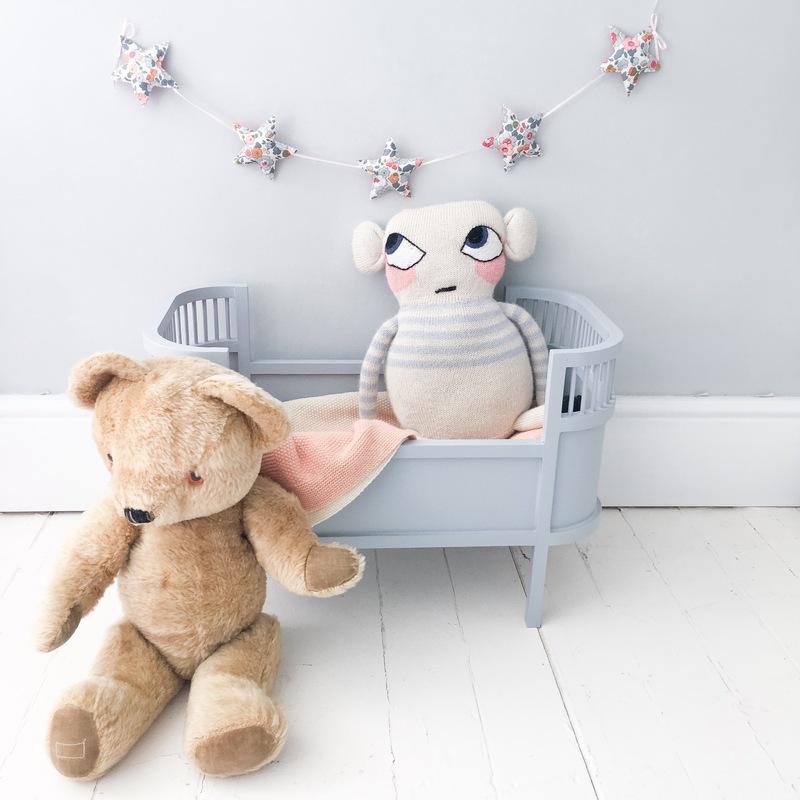 Below you’ll find a few more preview pictures of our new Velveteen Babies does Liberty collection. The garland styles will also be available in the other prints, and will launch in my Etsy shop on the 30th July. There will be limited quantities of each design and print so keep an eye out for our launch announcement. 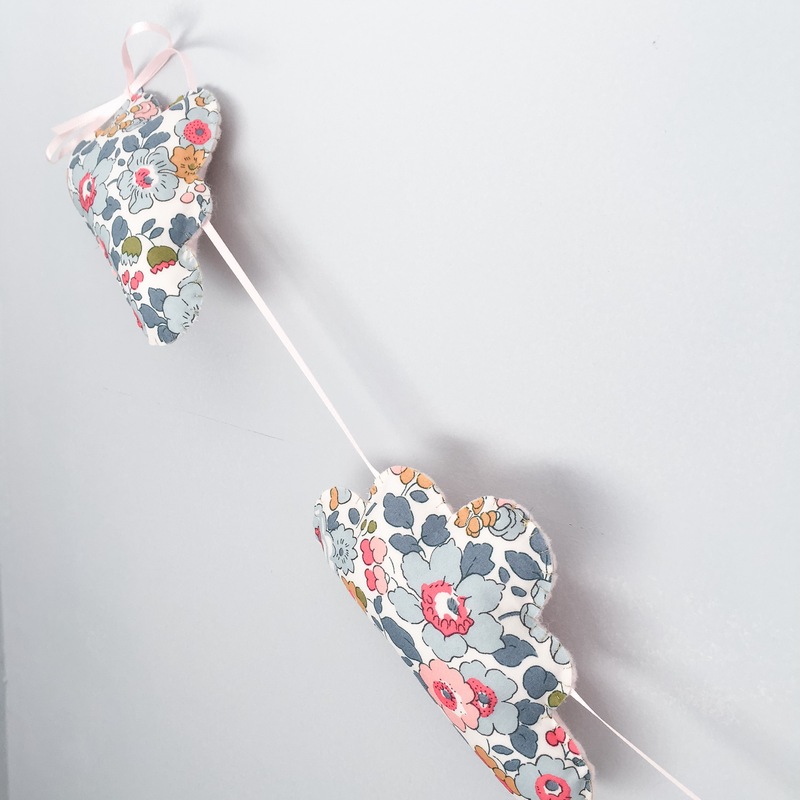 Velveteen Babies does Liberty Poppy and Daisy bunny garland . Bunnies have gold thread french knot eyes and are blanket stitched round inanyique gold thread. 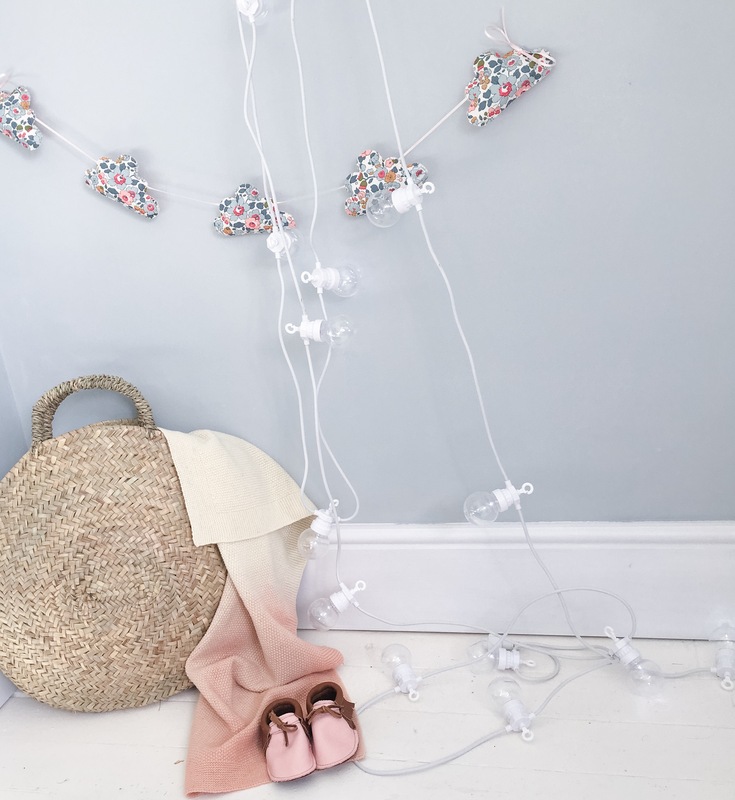 Velveteen Babies does Liberty Betsy drops garland.